“Welcome to the ancient city of China, a city known for its delicious sweets. As tourists, you can’t wait to taste them all — but before enjoying your sweets, you must learn about a legendary guy named Sweet Nose. He loved sweets so much that he wanted to eat the best sweet in the heaven, and to do that he climbed up a ladder made from shrimp. Just at the moment he reached heaven, the god of thunder met him while patrolling. The god of thunder was pissed because no mortal human was allowed to intrude the sacred heaven. A flash and thunder hit poor Sweet Nose, who fell from the ladder like a meteor and dissolved into a pile of black powder when he hit the ground, transforming into tiny insects — the ants. In any event, in this game, you’re trying to not be struck down by the God of Thunder – and to do that, you need to be the player who has eaten the least sweets. The board has a village on one end and a score track on the other which leads to a fairly ferocious cardboard standup Thunder God. 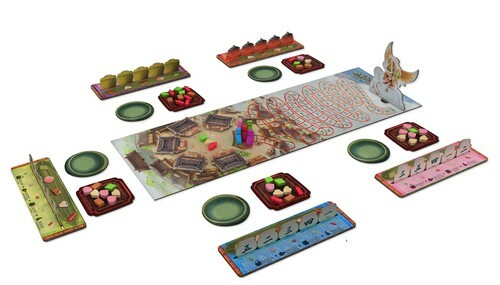 Each player gets a board with the 5 different sweets depicted on it, and they also get five ranking markers (1-5) with which they will rank the sweets. Each player also gets a plate and a bowl to hold sweets. The game itself is played over three rounds; each following the same general pattern. Setup: To start the round, each player is randomly given 8 sweet tokens to put on their plate and then there will always be three left over to start in the market on the board. There is a specific setup rule for each number of players… Then, players look at the sweets on their plate and then take the five ranking tiles and secretly assign a value to each sweet. These tiles are wedged into the player board so that no one else can see them. Exchange Sweets with the Market – Exchange one sweet from your plate with a different type of sweet from the market. Use your store (only in rounds 2 and 3) – if you have a store from the previous round, you may use it here. Each store is only used once, and after it has been used, it is returned to the supply. Each store has a specific special ability. Once the action phase has ended, each player then totals up their sweetness for the round. You count the number of each particular sweet and then multiply it by the value on the hidden marker on your board. However, if your number of sweets matches the number of that type in the market, you must add that number to your multiplier. Do this for all five types of sweets and then move your marker on the score track accordingly. You also use a special marker to mark your score from this specific round. In descending order, players may be able to choose a store from the market. Certain stores are only available if you have done especially well in the current round. For example, you must have scored at least 17 points in a round in order to be eligible for a store at all. Some tiles are only available if you have reached a particular threshold in the previous round – the scoring threshold is seen in the corner of the store tile. The player with the most points in the current round also becomes the starting player in the next round. The sweets are returned to the bag and two more rounds are played. At the end of the third round, there is no endgame scoring. The player with the fewest Sweet points wins as he is furthest away from the Thunder God and therefore least likely to be smashed into a million ants. 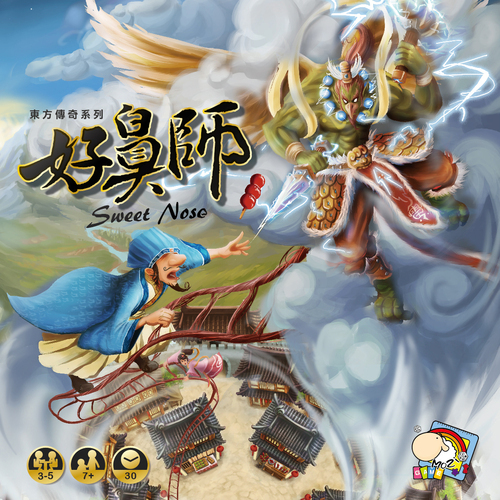 Sweet Nose is a very interesting sort of deduction game. You are trying to figure out what other players want/don’t want, while at the same time, you’re trying to lock in desired sweets for yourself. Early in the round, you might be just guessing… Or maybe you will limit yourself to trading with the market until you can figure out the relative value of things to different players. I suppose you could even be coy, and try to trick your opponents into thinking that you really want a particular type which is low on your scoring rubric. The second and third rounds are more interesting due to the introduction of the store actions. The store actions give you a little extra oomph to use once in the round. The issue I might have is that they are a bit “rich get richer” – as you have to do well in the previous round to get a store, and the actions seem to be better off at the higher point thresholds. We’ve only played it twice though, so I really don’t know if this is a well founded criticism or not. It seemed to happen in one of our games, and it was not an issue in the other. There is a little bit of screw your neighbor in the actions; I suppose that people could be particularly vicious and the entire table could end up picking on one player by trading over and over with him – however, this would also trigger the end of the round (which ends when one player’s plate is out of sweets), so that will hopefully balance itself out. I wish that I had had more time to play this prior to Essen, but we’re leaving in just a few days and I have to finish my pre-show writing now. We’ll re-visit this as a full review after the show. 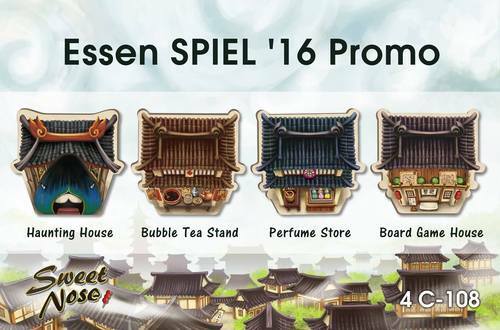 I’m also pretty excited to pick up the Essen promo stores that are on offer. They look like they will add some interesting actions to the game as well!